2) it is in a fun pastel, which I always advocate. 3) the top has that bow detailing- and for me it's all about the details. 4) the two pieces are more functional than any other one piece - wear them together as a set or as separates-options are endless. 5) it is much more easier to style, no accessory needed. 6) it fits TTS ( true to size ) - I am wearing a size SMALL top and a size 4 bottom. The print on print is so spectacular that adding another statement piece would have been an injustice to it. Hence lack of any necklace or chunkier bracelet. With such a soft color palette, I wanted to refrain from any dark shade and so other than the glasses, everything is in a softer shade including those heels. For that touch of glam I added the brooch, which is by-far the easiest way to add drama and pizzazz to any look. 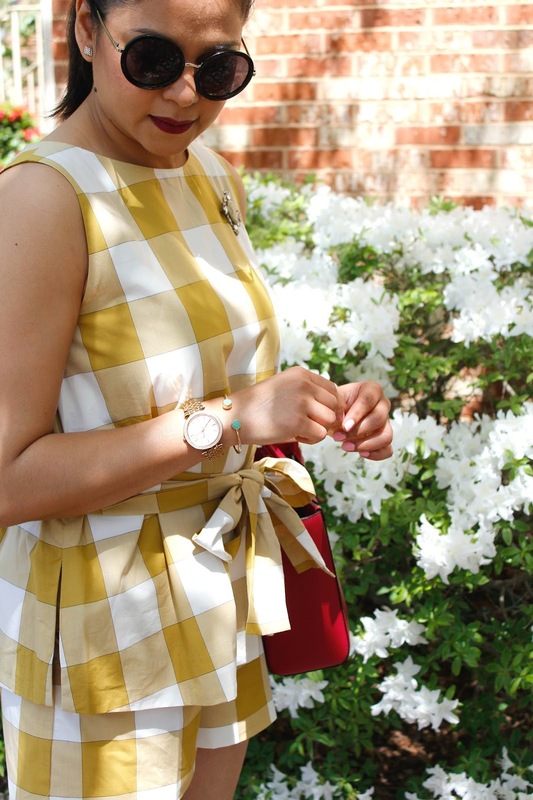 Congratulations to Tatiana of We Shop In Heels, she is the featured blogger of the week.